So let’s say you’re one of those residents of Chicago’s Western Suburbs who have decided to have your roof re-shingled. How does it work? What to expect? Here’s the entire process explained step-by-step. When you call our office or submit an online request for s quote, we will ask you some basic questions about your property. What’s the approximate size of your roof? What type of roofing do you currently have? What is the reason of re-shingling? 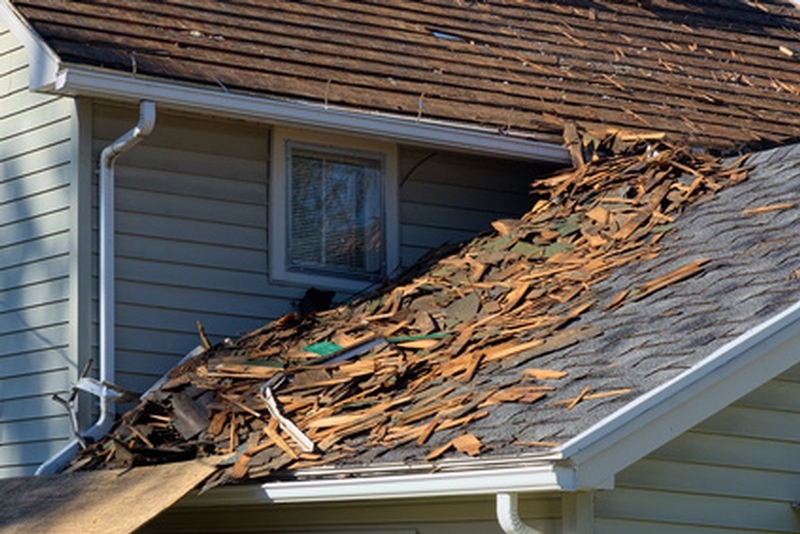 If you think that you may need a new roof due to a recent hail storm, there are more questions to be answered. Here’s a blog post on the topic of hail storm damage in Illinois and what should you do as a homeowner. Based on your responses, we will provide “a ballpark” quote in a matter of hours or schedule a property inspection. Regardless of whether we provide you with a ballpark quote or not over the phone, the next step is property inspection. We come to your home and—with your permission—get up on your roof and get up close and personal with it. This will allow us to provide you with an accurate, binding quote. If you decide to hire us, we present you with a written contract. The contract spells out all the responsibilities, warranties and other details of the project. In most cases, we would require a small retainer to move forward with re-shingling your roof. Our first hands-on job is to assure that your entire property is fully protected while roofing replacement is underway. This includes siding, walls, plants, bushes, etc. Depending on the type of your property and its surroundings, we may use tarps and protection plywood to make sure your home is properly protected while we re-shingle the roof. The Tear-Off step involves stripping the old layers of shingles and felt, and inspecting the roof sheathing (wood) for dry rot, water damage from a prior roof leak, and termite damage. This is arguably the most difficult and dangerous part of the process. All old shingles have to be completely removed in order to reach and inspect wood decking. Also, wood sheeting needs to be inspected to make sure that it is attached to the roof rafters the right way. Upon the inspection, we re-nail whole wood decking, so that the roof is fully secured. After wood decking is prepared we install drip edge at all edges of the roof. Drip edge is a piece of metal bend at 90 degrees to prevent rain from getting underneath roofing material on all edges. Next step is installing “ice and water shield” which is a special type of roofing underlayment. Ice and water shield sticks to the wood decking which prevents any water leaks. It must be installed at the bottom of the roof and at all roof penetrations (chimneys, pipe flanges, roof connections, etc.). After ice and water shield is applied, the rest of the roof needs to be cover with roofing felt. Roofing felt prevents shingles from sticking to the wood. After the above steps are completed and the base is ready, we start laying out the new roofing material. This step involves the shingle application carefully following manufacturer’s instructions. After shingles have been applied, you will have an exposed peak that needs to be sealed up. For this we will use what is called a ridge cap. We’ll apply the cap by laying the cap’s pieces so that they overlap each other. We clean job site daily. We believe that we have to leave our job site cleaner than it had been before we came in. You can check out our testimonials to see what our clients have to say about this part of our job. Each roofing replacement project includes a meticulously performed, post-roofing inspection. We want to make sure that your roof replacement is done correctly and that you’re satisfied with the result. Once the project is completed, we present you with a short customer satisfaction survey. With your permission, your responses may be published on our website. We only publish testimonials with real homeowners’ names! This is it! Hopefully, re-shingling your roof is now less mysterious and not at all scary. And if you need a new roof you know you can always call ATJ’s Home Improvement!